Cinnamon Rolls Pops is a recipe I totally got my inspiration from the blog called Ice Cream Before Dinner’s Cinnamon Roll Pops. I thought her cinnamon bun pops were cute, and I knew they would soon have to be coming out of my kitchen. I have been making cinnamon rolls for years, ever since I was a small child I learned how to make these from my mother. She is a talented baker, and growing up for bake sales my mom would make cinnamon rolls. She was famous from her cinnamon rolls. If you have been around here at CopyKat, you know that I have some cinnamon rolls that taste a lot like Cinnabon’s Cinnamon Rolls. So after looking at the photo in this picture, I quickly put together one of my favorite recipes, and then combined it with a quick and easy frosting that will set up in no time. Since this frosting dries hard, these are perfect to take to someone. 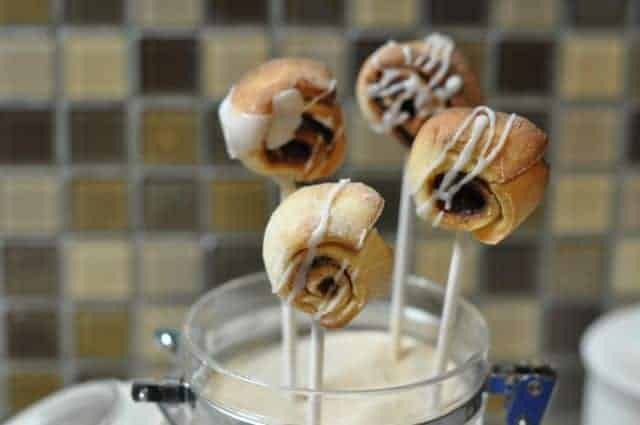 You can make mini cinnamon roll pops for a fun dessert. Proof your yeast by placing the yeast into two tablespoons of warm water and then add 1 tablespoon of sugar, and package in instant yeast. By proofing your yeast you can make sure it is active, if it fails to bubble within the first five minutes or so, it may be old. If the yeast is old, don't use it, your bread will not rise. In a small saucepan heat together milk and 2/3 cup of butter. Heat it until the milk is warm, and the butter begins to melt. Do not let this boil, you just want to get the temperature up to around 120 degrees anymore, and it isn't usable it will kill the yeast. Add warmed milk mixture to the flour in the mixing bowl and begin to mix with the dough hook attachment. The yeast should be bubbling now, add the yeast, and 1/2 teaspoon of salt. Add two eggs, and when they have incorporated, add an addition 2 cups of flour, if the dough is firm, and not sticky, you can simply let the mixer do the kneading, if the dough is sticky you may need to add an addition 1/3 to 1/2 cup of flour. After about five minutes of kneading, this can be done by hand on a floured surface, or by the mixer place the dough into a covered container or a bowl with a towel on it, and allow it to rise. 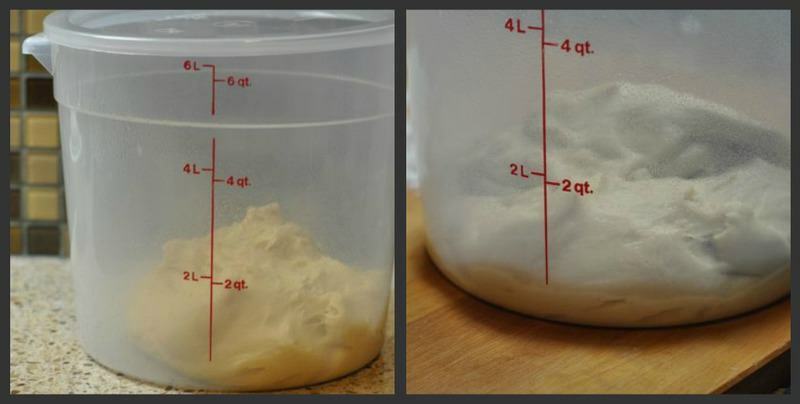 It will take 1 to 1 1/2 hours for the dough to double in size. Prepare the filling of the cinnamon rolls by mixing together the 1/2 cup of butter, the brown sugar, and 1 to 2 tablespoons of cinnamon. I like more cinnamon so I am heavy handed in my cinnamon, I'll add about 2 tablespoons. Cream together this mixture, have it ready to prepare your cinnamon rolls. Once the dough has risen divide dough into two balls, and then roll out the dough to about 1/4 inch thickness. Use a knife to square up the dough so you can roll out nice even cinnamon rolls. Spread filling onto the rolls, you don't need a lot, too much and the filling will melt out of the cinnamon rolls. Cut the dough in half again, you only need to make a couple of turns of the dough for the cinnamon rolls. Be sure to roll the cinnamon rolls tightly so they don't spread out too much. Make three quarter inch cuts in your cinnamon rolls and place them on a greased cookie sheet. 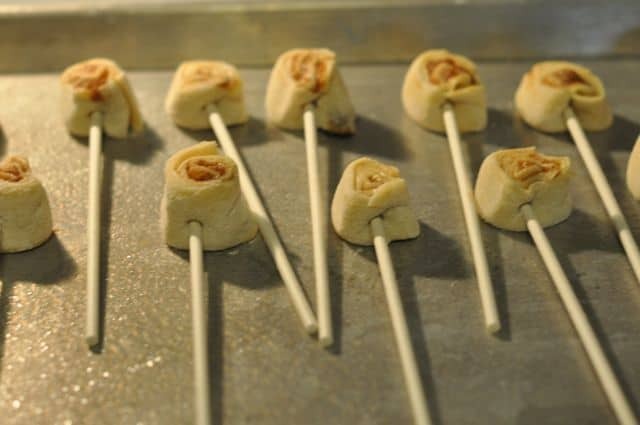 Place a candy stick into each one of them about midway up before baking. Bake for approximately 12 - 15 minutes in a 350 degree oven. It is better to err on the side of underdone, because if these cook too long, they become very hard. Remove from pan immediately and allow to cool. Make the frosting by adding the powdered sugar, vanilla, and a couple of tablespoons of milk in a bowl. This icing will be hard to stir, and you must mix these together for several minutes. If the frosting is too thick, add a teaspoon or two of milk until it is thinned so you can drizzle the frosting over the cinnamon rolls. Finish by drizzling frosting over the cinnamon rolls by loading a spoon full of the frosting and waving it very quickly above the cinnamon roll pops. Whew 😉 These are very easy to make, and if you have never tried making a cinnamon roll from scratch, you should give it a try. Kids love these, as well as folks in the office. It is really hard to refuse a small nibble of most anything. Very cool idea. They look perfect for a kid’s party. But on the other hand, I surely wouldn’t turn one down. It’s difficult to turn down anything that comes in a little nibble size. I can see me making these for treats for a Halloween party and drizzling them with black and orange icing…flipping a Styrofoam egg carton over and sticking them down in there and cover the carton with spider webbing, plastic spiders, and bugs 🙂 I’m ready for autumn!!! What does she have these cinnamon pops standing in? I didn’t have anything to stick them in, so I placed them in the container of yeast that I had, I hope you didn’t mind too much 😉 I thought having them upright, made more sense for the photo than putting them on a plate an laying them down. I saw a cake pop “baker” at Khols this weekend. Looks like a waste, but maybe for those of us that aren’t so good at decorating it would be fun to try out. I saw the brownie pop thing at Michael’s today. What’s wrong with cutting out a brownie and drizzling ganache all over it.